Sketched a week ago on a sandy beach, overlooking the waves of Lake Michigan, with the buildings and bustle of Chicago in the background. I learned my first lesson in simplicity when I decided to move overseas in early 2001. It was me, my 2 duffel bags and my 2 backpacks. All my worldly possessions (minus a few things I had in storage at my parents house)…just 220 lbs of mostly clothes, books and meaningful momentos that would remind me of home. I was off to the Dominican Republic, to teach and serve others. I found myself in a culture that moved at a different pace. A slower pace. A gentler pace. A reasonable pace. One that I resisted at first, but came to appreciate and cherish after a few years living within it. It was simpler pace. (Although it might not seem like it, with all the crazy motorcycles whizzing around town.) The focus was not on “getting things done” or getting to the top, or having the best and most of everything. There were no Joneses in the DR. So there was no one to keep up with. All this to say…I learned to love simplicity and it will always be something I strive for in my life. 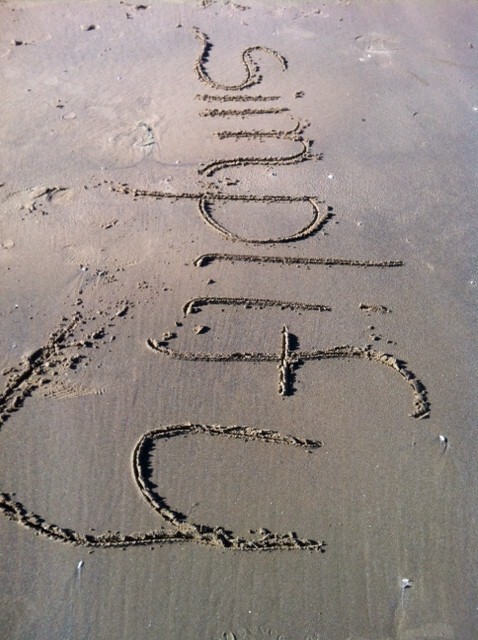 But this year, I’ve decided to focus on it more intently…so I’m making “simplify,” my word for 2012. And here’s what I think it will look like when put into practice this year. If you were to look at my planner, you might be surprised. There’s really not much on there right now. Other than the kids swimming lessons and a handful of business trips, I keep my schedule really light through the winter months. I have said “no” to a number of different activities and requests, in an attempt to maintain balance and a simple schedule. This gives us plenty of room for spontaneous activities, to help others when they are in need, and to be adventurous with the boys. We just don’t need more “stuff.” We have plenty…and are perfectly content with the many things we have been given or purchased. But here’s where I need to simplify and stay focused with my spending. I have a tendency to “make up errands” and end up purchasing things we don’t need or really want. Let me explain. It’s Thursday afternoon, dead of winter…and I need to get out of the house for a bit. So I start looking around and think “oh, we should really have this. or that. or maybe I could redo this or get new curtains for this room,” and 20 minutes later we are bundled up and on our way to Target. Or Lowe’s. Or wherever. We really don’t need any new curtains, but I was bored…and wanted somewhere to go…so I made up the fact that we needed new curtains for the guest room. Even though it is fine how it is. And then, while in the store, I decided we “need” this, that and the other…end up walking out with way more than we need or want. This happen to any of you? Surely, I’m not alone in this? Maybe you’re doing it and don’t realize you’re doing it? Note: These “I’m bored errands” of mine really only happen in the winter when I’m suffering from cabin fever. Simplify. My hope this year is to simplify my thoughts and my worry. To be in prayer, rather than fret. And to shutdown the worry part of my brain. My hope is that I can lead a simpler life this year…one not focused on things or appearances, but focused on my family, my friends and helping others with their grocery spending! And I’ll be sharing more of my personal, parenting, professional, and financial goals for 2012 later this week. And how I manage my goals on a week to week and month to month basis. I’ll be sharing a stellar (and free!) printable template for my weekly goals & plan that’s really helped me simplify my life and keep me moving in the right direction! As we head into 2012 with fresh clean slates and the chance for a new start, I thought it would be valuable to team up with a few other bloggers and share what our plans are for the year…and hopefully inspire and encourage you to do the same! In the next few weeks I’ll be highlighting and sharing all the New Year, New You posts from 5 other fabulous bloggers. We’ll be sharing ideas and challenges that will help you in this New Year. We’ll be talking about journals, reducing sugar in your kitchen, meal planning, weight loss, food allergies and much more. Your turn. What’s your “word for 2012″…what are you focusing on this year? What theme can you give to this year? What can you do make your “word” a reality? Simplify is my word, too! I am so looking forward to leaving the chaos and clutter behind! I like dedicated…a lot! And what a wonderful and beautiful life and family you have too! God has blessed beyond what I could hope or think, Erin. I’m so grateful. Love it!! I definitely want to focus more on simplifying during 2012 as well which goes well with my 2012 word… PEACE! I want 2012 to be a peaceful, restful, organized year for our family in a way that it has not been before. I want our children to feel the peacefulness and rest in our home. And I want our hearts to be at peace where we are, with what we have, and with this time in our lives. Rock on girl…you can totally do it! You both “ooze” God’s peace…and I know you are oozing it onto your children. Peace, like faith, is one of those “contagious” things! I have yet to think of a word for 2012 because there are a few too many things that I know need fixing. I need to simplify, spend better, be more patient with the kids, be more organized and productive, waste less time, actually do the things that are important to me instead of thinking about doing them and feeling bad when I don’t. I want to be healthier, more natural as a family. I have already started working on this because of a friend who introduced me to essential oils late this summer so we’ve been exploring more natural remedies for our health. I want the kids to eat the best versions of the healthy foods they already like (i.e. yogurt with less sugar/more protein). Maybe my 2012 word needs to be “BETTER,” because in a nutshell I guess that is what we’re aiming for over here. Being and doing “better” all around. Hope you are well…we haven’t talked in forever. Next time you’re bored, feel free to give me a call instead of going on an “I’m bored errand” (and yes I do that too!). I love BETTER. Can apply to anything, be general or specific as you like. And so glad I’m not the only one in the world running “I’m bored” errands! And I do have a question for you. And we do need to catchup! Will call soon! I don’t have a word, but if I did, it would be something like simplify or faith or persevere. Those have all been big ones over the last year, and they will continue to be in the coming one. Love those Tara! The 3 words intersect each other at so many moments, as we live our daily lives! Less is more! Did you get it figured out yet?!? I am not sure what my word would be. Maybe “risk” because I plan on taking the risk of putting my writing “out there” for others to read now. Or maybe the word is “courage” for the same reason. All I know is I am no longer lsitening to the voice of self-doubt. I vanquished that voice when I managed to lose over 145 lbs, and I will vanquish that voice when it comes to my writing goals too. Good for you! You go! I think “risk” is perfect for you! I love this corner you are turning! Awesome Lecia…I think balance is on my list of words to focus on in the very near future…like 2013! Thanks for sharing! I have been thinking of a word for the past week as I have been working on all of my 2012 goals. I keep coming back to ‘productive’. My mind tends to wander A LOT and I waste time with things like mindless tv and web surfing. I want to make better use of my 168 hours and focus on the time spent with my kids, my home, our small business, my fledgling blog career, my running and other hobbies. I can relate about the winter boredom. I go out of my mind stuck indoors in the winter and so do my kids. “conflicting and changing priorities”…I’ve written about this on Savvy Blogging. It’s tough, but you can do it! Give your attention all to what you are doing, stop multitasking. Focus on what’s in front of you…and shift your focus when needed. Thank you for being real. Your struggles with worry really spoke to me. It is good to know that I’m not going crazy. I need to spend more time in prayer instead of worry. No…you are not going crazy! Try to catch the worry as it’s starting and turn it into prayer! Healthy is my word for 2012. It’s more all-encompassing in my brain but boils everything down to what matters right now. A great word to be focusing on all year long! I just discovered your blog and I really look forward to this series! Thanks! For me, this year will be about accepting and appreciating simplicity in my life. Huge changes are coming to my family – my husband is active duty Air Force and for the first time since I met him (6+ years) he has orders to move – from Tucson, where I have been for 8 years, to North Dakota (i.e. the middle of no where). This will be the first time really in my adult life I will be completely out of control of what is happening in my life. I am a career woman, I finished a Master’s degree and I have worked my tail off building a career over the past 5 years with a company I was sure I would be with for the rest of my working life… And now I have to walk away from all that to move to the complete unknown and start over… My goal this year is to embrace this as a gift, take a step back from the crazy pace my life has been going at, and actually take a few months off before looking for a new job to spend time with my 2 year old, travel home to see family, get my new house in order and focus on really simplifying and slowing down my life. And actually enjoying it and accepting it – I’m the kind of person who has problems sitting still and allowing myself to have fun (rather than working all the time). Plus with our family income going down by a good 60-70%, we will be needing more simplicity! Thank goodness we are already very frugal and good with coupons and out of debt (other than car payments) or I don’t know how we could survive this. Again, thanks for hosting such a great blog! Welcome Sarah! What a transition you are facing…I think embracing simplicity during times of transition are essential. You can focus better on your emotions, the physical aspects of moving, and the relationships/responsibilities you are leaving behind, and take on the new ones on “the other side”. Great post, helps us all to think about what we are looking to do this year. I think my word would be ‘Brave’. I am stepping out doing many things that are out of my comfort zone like public speaking, teaching classes, etc. All of which scare me to death, but I am trying to overcome that and be brave and take risks. I’m trying to trust God with the plans he has for me instead of trying to control my own life and running out of fear from what He’s called me to do. Good for you girl! Trust is all you can do! Happy New Year to you and your cuties too! May I cheat a little and have a phrase rather than a word? My guiding principle for 2012 is “attitude of service.” I have found myself so resentful of my family obligations (single parent to an active 9 yr old), my work obligations (FT), and my zillion other obligations. But why be resentful in the face of such abundant blessing? For example, doing laundry is not my favorite. But how blessed are we to have clean clothes, towels, sheets, etc! How blessed are we to have the facilities and water to keep our clothes clean! How blessed are we to have clothes and coats and socks to keep us warm in winter! I love your perspective Patty! You are going to have an amazing year with this attitude of service and gratitude! My word – PRESENT. As in to live in the PRESENT, not to regret the past or fret about the future but to live in this moment. The PRESENT is the only time we have – we can’t go back and we are not guaranteed the future. The PRESENT is where things get DONE instead of put off. The PRESENT is where I should be focusing, and where I should find joy every day. The PRESENT is where I need to live my live, love my boys, relate to God, help others, take the steps to achieving my goals. SO loving the one word theme! Patty – love the post, the Proverbs 31 woman is one high bar! Go you! What an excellent word Jessica! I’m adding it to my list too! BASICS. I know what makes me happy. I know that working out on a regular basis, watching what I eat, having dinner with girlfriends, going to movies with my kids, going out to dinner with my hubby, and many other “small” things – make me happy. They are the basics. I need to remember these and strive to include them in my life each week, instead of filling up my life with the newest, best, pretty, shiny, thing that I think will enrich my life. God began me on this “simplfy” journey in August when my 11 yr old daughter was diagnosed with Asperger’s Syndrome and I found within a couple of weeks of that many of my activities (things that were good and that I LOVED doing) disappearing for no reason. I struggled with it for a week or two until my pastor pointed out that God had a reason for this and to sit back and listen. I heard God telling me that HE wanted me to have more free time during the day so I had plenty of time to get everything done so I had time to focus on my daughter and her homework (which she has needed LOTS of help with) when she gets home from school. It’s not always easy, but it’s been a good thing. A little book that has helped me tremendously during this and put into words(on the Dec 27 passage) exactly what God had been doing in my life this fall is “Jesus Calling” by Sarah Young. Thanks for sharing those titles with us–I look forward to looking into some of them! Good luck with Simplfying!! For 2012 I’d like to move from surviving to thriving. I sometimes feel so bogged down by just trying to get by and get it all done every day. I want to live more fully and really thrive in the moment of all that God has graciously given me. I’m trying to embrace simplicity, minimalism, and frugality now more than ever! It feels great, BTW. I’m curious, though…how would you differentiate between “simplicity” and “minimalism”? In a way, I realize that they’re not really the same thing, but I’m hard-pressed as to how they are in fact defined as different. Perhaps “minimalism” is buying or having things with a clear and thoughtful purpose, while “simplicity” is DOING things with a clear and thoughtful purpose? I’d love to hear more of your thoughts regarding this aspect. My word for the year is really two, but they are related. Health and Energy. I went through surgery, chemotherapy and radiation treatment in late 2010 for uterine cancer. My prognosis is really good, but, I am now just getting all my energy back. So health is premium for me, and the energy will be a way to determine that health. I will walk more, and even hit the gym. I have a goal to take 4 flights of stairs upa dn down each day. May not seem like much, but it is a start. The way I am eating takes into account health and energy. I have hanging in my office and on my fridge at home the saying “Fighting cancer is hard! Eating right is nothing in comparison.” Best to you and your family. Have enjoyed your site the last year and a half. Love that phrase…thanks for sharing your story Nancy! You are amazing and an inspiration. I love your words for this year! Great post! We have been moving in this direction too. I was wondering if you could share your simplified work schedule as a blogger. I’m a blogger too but am not nearly as productive as you are. I have lots of ideas in my head that keep getting pushed to next week because there are too many pressing issues this week. I devote from 8-9am every day to my blogs but it just doesn’t seem like enough. I work anywhere from 1 to 5 hours a day on the blogs and other projects…sometimes more, depending on deadlines. I’ve written a number of time management and productivity posts over on SavvyBlogging. Oh yes that helps a lot. I had to subscribe to that blog right away! Lots of great ideas I have been looking for. Looks like I need to clear more than 1 hour a day to work on my blog. Thanks for the help!